The next Social Marketing University training is coming to Washington, DC on January 11-13, 2010. If you’re interested in learning the fundamentals of social marketing to bring about health, social or environmental behavior change, this is the course! The training is for people working at nonprofits, government agencies, PR/marketing agencies or others who want to build knowledge and skills for building an effective social marketing strategy. If you’re already familiar with social marketing but want to learn about how to use social media within a social marketing program, you have the option of just attending the last half-day, which is the Next Generation Social Marketing Seminar. This course is being co-sponsored by the Public Health Communication & Marketing Program at the George Washington University School of Public Health and Health Services. 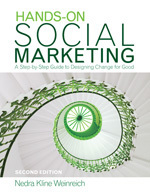 The agenda will include a social marketing case study presented by the program’s director, Doug Evans. For more information about SMU and to register, see the Social Marketing University information page. If you register before December 11, you will get a $100 discount. You can also receive additional discounts when more than one person from the same organization registers, or if you are a student. As a reader of my blog, you will get an additional $75 off on top of the other discounts by using the discount code ‘BLOG’.